Tools I used to ready these blades. 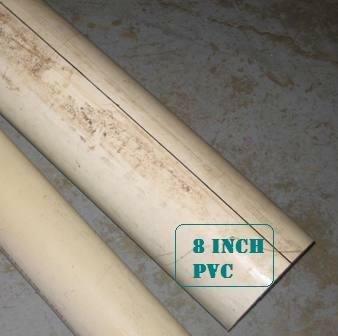 2ft(24inch) Section of 8" PVC Pipe. Sandpaper to fit sander of choice. This is the 8" pipe that I got that was scrap. 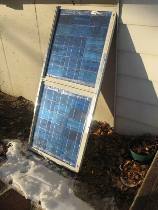 Here is a picture of the blades that are after they are cut. In the ruff stage. - Alrighty first thing you will do is to lay the 8" PVC down lengthwise on a level surface with a 4ft level against the side. This will allow you to make a straight line down the side horizontally with a Sharpie marker. - Next Take a sheet of paper and measure 6" either way (horizontally or vertically) and make a line across the piece of paper. - Take the sheet of paper that you just made the 6" line on and lay it where the line you have drawn on the pipe is parrallel to the line drawn on the paper at a 90 deg angle. Do this on both ends and make marks on both ends of the pipe. (This is done instead of measuring on straight on the pipe to get a more perfect measurment). - Take a straight edge of some sort and connect the lines from one end of the pipe to the other. This will make you a nice straight section of 6" pipe down the pipe. - Now take and do the same thing around the pipe 2 more times you should end up with 3 sections of pipe 6" wide, and 1 section that is much smaller. 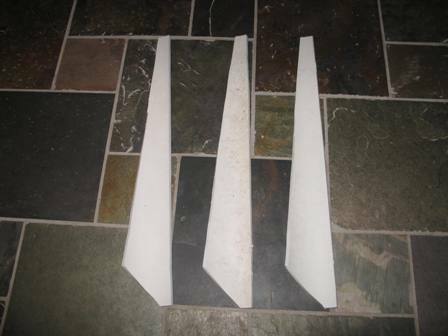 These 3 sections are enough to make 6 pvc wind generator blades.